Arkansas was blanketed with snow yesterday, up to 2 feet in NW-Arkansas, and about 6″ (officially) in central Arkansas, although it looks like much more to me. When you have an unexpected day off, what do you do? Read. 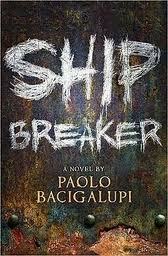 I had already bought Paolo Bacigalupi’s book, Shipbreakers, which just won the Printz award for best teen fiction. So, I read it. Great book. It’s a great example of how to start action in media res, and keep the action going. This is a futuristic world, almost a dystopia. But we don’t have a prologue that explains all this, rather the information is given naturally as the story progresses. We don’t know information until we need it. Learn. I also watched some YouTube videos in my on-going self-education about book trailers. 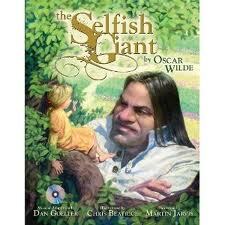 I found this video to be an interesting introduction to the book/CD of The Selfish Giant, with musical adaptation by Dan Goeller and great new illustrations (March 1 release date). Maybe I just liked it because I’m snowed it! Observe. Finally, I went walking in the snow, taking pictures. I snapped pictures of birds at my feeder: rufous-sided Towhee, downy woodpecker, tufted titmouse, chickadee, blue jay, cardinal, house sparrows, house wren and more. In other words, I filled the coffers with sights, sounds, smells, textures, temperatures and more, so that when I sit down to write, I’ll have something to draw upon. Today–I’m back at my computer, even though the world outside glitters and beckons. Because that’s what writers do: we write.